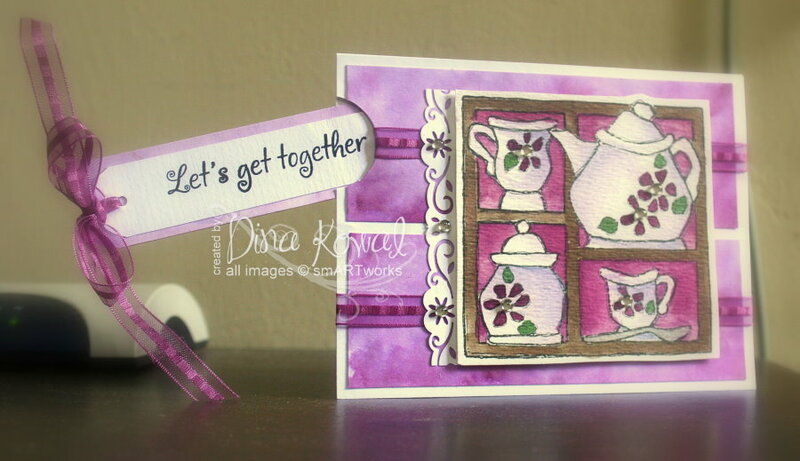 Dina Kowal Creative: anyone want to come over for tea? anyone want to come over for tea? Anyway, I wish you could see this card in real life, because it's sooooooooo shimmery. The image is painted with Twinkling H20s, and I used the same paint to create the background (using the Smackin' Acetate idea). Your card is pretty enough to make me switch from coffee to tea! Oh so sorry to hear the kids have been sick! I do hope you'll be spared - you need your strength to take care of all these sick people around you!! Love the card - such pretty colors! This is absolutely beautiful! I love this stamp set and probably have to buy it now!! I have a friend who does tea parties, and she would love these cards...hope the kids are feeling fine soon! Oh I so identify with the kiddos and how dependent they are on you! Glad to know you are still finding the time and energy to create! And such a lovely card! Love the tag element, too.